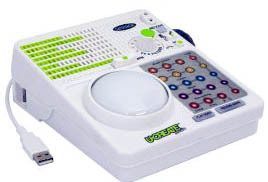 Create your own tracks, add your own vocals, and use the trackball to add some scratching. Mixer connects to your computer (PC or Mac) so you can go online to get download packs. Save what you make and play for friends. UCreate Music is an easy-to-use digital music-making system from Radica that allows kids to mix music just like a music producer. Kids and teens can express themselves through creating their own songs, performances and re-mixes with the fun and innovative interface. They can record samples, mix and match loops, share creations with friends and update and explore new content on the site accessed through the sytem. Build from a collection of tracks, special effects and filters from the online library.